I’ve always known I’m a trans woman. In early 2015, after decades of hiding, denial, and a horrific marriage, I finally realized it was time to transition. It was amazing to realize the time had come; I was a free woman and could live the life I needed to live. It was also during this time that I discovered my love for scuba diving. The Madison Scuba crew saw my life collapsing around me and took me in. I went from being a customer to one of the staff. I spent 2015 fully immersed in diving. I was at the shop almost every night learning the trade. I went on four international scuba trips. I was diving multiple times per week and I was getting involved in every teaching opportunity I could. Scuba became my passion and the reason I got up every morning. My friends at Madison Scuba quickly became my second family, the family I chose for myself. Despite this knowledge, my fear to reveal to them my true gender remained. I also spent that year trying and failing to casually date before I started HRT, and things got more awkward. I had convinced myself that this was my last chance to be with anyone. I couldn’t understand how anyone could possibly love and want to be with a trans woman. I figured I was damaged goods and thought I’d never be in a serious relationship ever again. Then, in early 2016, I met Becky and I saw my transition plans turned upside down. What started out as casual dating quickly turned into the most satisfying and intimate relationship I’ve ever had. Before I knew it she was staying at my apartment almost every night. Becky got to know my diving friends and became Open Water Diver certified so she could share the passion I’d discovered. Soon after that I was moving money around to buy a house. By month five the two of us and our dogs were all living together in suburbia and I was freaking out. Our relationship was getting very serious and I could see another marriage was in my future. There was no way I was getting straight married again. 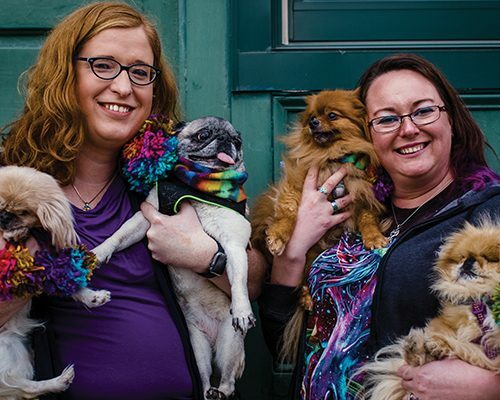 Shortly after buying our house I found out my health plan was going to start covering trans care. It was then I knew I had to figure out a way to reveal who I was. After a few awkward nights of wearing skirts around the house to get her reaction, I told her one night after one of our date dive nights. Becky was the first person I ever told I was trans and it was the most terrifying night of my life. We sat in the dark that night crying and talking, trying to figure out our new world. And we continued that conversation into the coming days, weeks, and months in order to help us navigate our new world and figure out how to make our relationship work. It took some trial and error, but in the end she stayed. She became my wife and my biggest cheerleader. Becky was immensely helpful in piloting my coming out process. She was a sounding board before anyone else knew, someone I could talk to and confide in. She arranged for makeup lessons from a drag queen friend. We went shopping at the mall together to help me figure out my clothing style. She helped me traverse the newfound world of female grooming techniques. She talked me into coming out to my Madison Scuba family, and then embracing their support. Most importantly she pushed me out the door to coming out to the rest of the world and eventually going full time, just seven months after I came out to her. I really don’t know how I could have transitioned without the love and support of Becky. I couldn’t imagine a better partner to have in my life. We still have a few hurdles left in my transition, but as time has progressed it’s become more mundane. I’ve been full time for nine months now and I’m starting to live comfortably in my new life as a woman. My life has become unrecognizable from what it was three years ago. Everything in my life has changed for the better, and I have my amazing wife Becky and my scuba family to thank for that. Through all the hardships and trials my life has gone through in the past few years, these are the people that have stood by me and supported me in every step. We are the people for whom the journey does not stop at the water’s edge, and we gladly take those journeys together. Yesterday I returned from a Belize scuba vacation with my wife. Those words are a glaring contradiction to what I knew as my life just two years ago. In 2015 I finished grad school and was looking for a job out of state. During that search, I was still dating in Madison occasionally, but making it clear to each guy I met that I wasn’t looking for a long-term relationship. Then I met Ehren. I had never been anything but a straight, cis, girl dating straight, cis, guys, and that’s exactly what I thought I was getting into once again when I met Ehren. We both stated our intentions not to get into anything serious, and then immediately got into something serious. We made sure our dogs got along, met each other’s friends, and said “I love you” pretty quickly. During our courtship, I noticed Ehren wasn’t your “typical” macho man, but I thought nothing of it. I lack in femininity what she lacks in masculinity, so I never cared much about gender roles or questioned whether my boyfriend was anything other than cisgender. By month five of our relationship we had bought a house and adopted a dog together to add to the three we brought to the relationship. I had earned my scuba certification at the dive shop where Ehren was teaching. We were going on weekly date dives together. I was no longer moving away for a job. I figured I’d keep working where I was until I could get promoted or transferred to something that made better use of my education. In August of 2016 my world turned upside down. On the first day I lost my job. On the third day Ehren put one of my skirts on, which I assumed was just my goofy boyfriend trying to make me laugh. On the tenth day I came home to find her in the kitchen, wearing another of my skirts, cooking dinner, and I knew there was more to this than goofiness. I didn’t react except to ask how her day was, pretending that it was the most normal thing in the world for me to find her cooking dinner in a skirt. On the eleventh we went on a date dive, and on the way home Ehren began to confess that there was something she had to tell me that she had never told another person. We sat in bed that night as the conversation continued, until she said, “I am a transgender woman,” and collapsed on my shoulder in tears. I held her and stroked her hair and told her it would be okay, without having a clue what that meant. In the subsequent days and weeks, things were a blur. Ehren asked me repeatedly if I was going to stay, and I asked her repeatedly what her transition was going to entail. Both of our answers rested on the other person’s decisions, but neither of us knew yet. We finally realized that we can’t know what we don’t know, and that those answers didn’t need to be made immediately. We agreed to maintain open communication, and at the end of the day decide if we’d had a good enough day to stay together for another. Day by day was all we could do for the moment. Looking back, we did things wrong and right during that time period. The first thing we did wrong was bargain and make promises about the transition. Ehren would tell me she wasn’t going to do something, or I would say I couldn’t stay in the relationship if she did something. Transition is a journey that neither the trans person nor the partner can predict feelings about a mile down the road. I didn’t think I could handle her on HRT, but it wasn’t long before that felt like the natural next step for both of us. We both had a variety of thoughts on surgery before we arrived at the common place we’ve now found. What we did right was continue to find some normalcy in our lives. For us it was continuing our weekly scuba dates. It was through this, while still unsure of our future as a couple, that I realized Ehren was my person, regardless of gender. We were in Devil’s Lake one afternoon, with the din of the world shut out, just the two of us hand in hand. That Zen feeling that comes with diving had already washed over me. Knowing there’s nowhere else you need to be, and that you can relax and shut out your stress. Ehren hugged me, then took her regulator out of her mouth to kiss me. It was that moment, underwater, that I knew I was going to stay in this relationship. Gender doesn’t matter in the least bit when you’re wearing a wetsuit and invisible to all but some friendly, curious fish. The other thing we did wrong, until we did it right, was underestimate the love and support from our friends and family. Diving was so important to us in those early days, and the Madison Scuba crew had been Ehren’s second family for years, but she was scared of becoming an outcast for being trans. We kept it secret, and held too much on our own shoulders. When she did come out to them, they welcomed her with open arms, and we wished we would have told them much earlier. I won’t say that life was instantly easier when we had a support network and knew the direction our relationship was headed, but it helped. We’ve continued to throw ourselves headfirst into our love and into diving. We’re now married, and our common love for diving and teaching keeps us busy at Madison Scuba and around the world on trips. In the early days, we were so focused on Ehren’s transition that it consumed our lives, and sometimes took the joy out of it. We learned the importance of being thankful for small steps, and not making them feel forced. Some people still ask me what this makes me. My mantra in the early days was “I am human,” because I really didn’t know other than that. I would say that I’m still straight, because Ehren didn’t come along and flip a switch in me as far as I know. That being said, I’m in a relationship with a woman, so I am functionally a lesbian. I fell in love with Ehren while unaware of her gender, so my love is a pansexual/panromantic one. What I really hope our relationship proves, though, is that the labels don’t really matter at all. Which brings me back to my first sentence. This was our first trip since we were married, and our first trip since Ehren has been out full time. There was some fear going into it. While it is important to be aware of your travel environment, we were reminded that most people travel and return without incident. We had an amazing weekend of diving, no incidents of LGBT mistreatment during travel, and the most aggressive encounters we had the entire time were from fish pulling our ponytails. We saw manta rays, nurse sharks, eels, and some of the most beautiful topography of any dive I’ve ever done. We dove 11 times while in Belize, visited some Mayan ruins, went zip-lining through the jungle where we saw howler monkeys, and went tubing through a cave system that was once used by the Mayans for shelter. 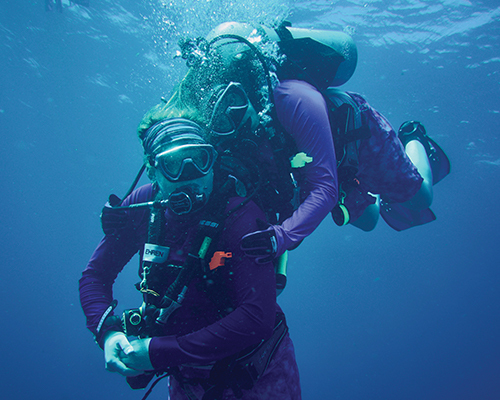 We grew closer as a couple, and with our Madison Scuba family that we traveled with. It is possible to find out that your partner is not the gender you previously thought, and still have a lasting relationship. However, it takes work, and you can’t let it consume you. Maintaining as much normalcy as possible, and finding a common love—in our case diving—was essential for our relationship.